The L7 stands alone as the most unique subwoofer on the market, with a cone shape that is exclusively designed to produce more output. The ultra-rigid, injection-molded square cone was a KICKER first, and now it’s stiffer than ever as the patented ribbed corners completely dictate cone motion. Simply put, the square cone represents more surface area than a similarly sized round cone, pushing more air than its counterpart. 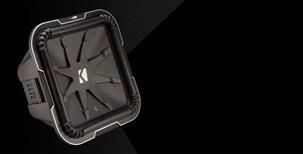 More air movement assures louder volume, and that’s what KICKER and Livin’ Loud is all about.